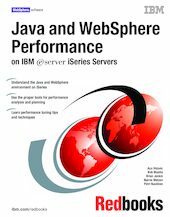 This IBM Redbooks publication provides tips, techniques, and methodologies for working with Java and WebSphere Application Server performance-related issues with a specific focus on iSeries servers. The intended audience includes iSeries system performance experts and WebSphere Application Server and Java developers. This book attempts to provide you with a comprehensive and accessible resource that has gathered information usually found in a number of disparate sources and placed them in a single reference.